The December 2006 photo assignment, pool of light closes at the end of day on Sunday, Dec. 31. You still have a little time to send in your entry. Participating is easy. All you have to do is attach your assignment photo to an email and send it in. Title your subject line: Photo Assignment [month, year]. Attach your entry making sure that it is no wider than 600 pixels. Include a few sentences about why you took this approach, the camera you used, and any setting details that you think are important. Address your email to: derrick@thedigitalstory.com. If you can, don't remove the EXIF metadata as you prepare your image. I like to list this information with the picture when it's displayed in our gallery. 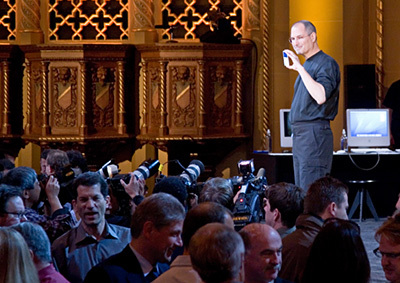 As an example, this image of Apple CEO Steve Jobs was captured in Oct. 2005 when he unveiled the iPod 5th Gen video at a press event. Steve is standing in the pool of light while others mill about in the shadows. I've been testing fine art papers for Epson and HP "B" sized printers, and I've come across a real diamond in the rough. 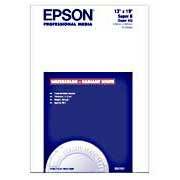 Epson's Watercolor Paper Radiant White costs less than half as much as their Velvet Fine Art Paper, but produces comparable results with a higher archival rating. Both papers have a bright white surface that produce vibrant images, feature texture and weight that feel good in the hands, and dries instantly for easy handling. I've done many side-by-side prints with both stocks, and the watercolor images come very close to the vibrancy of those printed on Velvet Fine Art. The kicker is, you can get 13" x 19" (Super B size) sheets of Epson Watercolor for about a $1 a sheet, and the Velvet Fine Art runs about $3 a print. Another interesting note is that the archival permanence for the Watercolor is 92 years compared to 61 years for Velvet Fine Art. I can use the regular sheet feeder on an Epson R2400 for the Watercolor, but had to use the manual sheet feeder for the Velvet, which is a heavier paper stock. 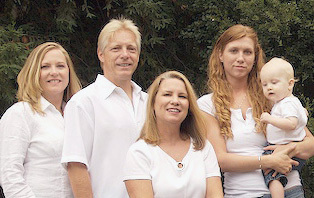 No doubt, the Epson Velvet Fine Art paper is fantastic. It is heavier than the Watercolor and has a better D-Max rating. But when I put large B&W images next to each other (printed on both papers), I'm thrilled by how well the Watercolor prints hold up to those on the Velvet Fine Art... for about a third of the price. I'm a big fan of portable, sturdy tripods, and I have a decent collection of three-legged critters that I use regularly. During the holidays, I received a new addition to my stable, my first Gorillapod -- the original model. And I'm having a blast with it. The original model, which is also the smallest, is perfect for my Canon PowerShot SD 700IS. It's a 150mm tall (6") and only weighs 45g (1.6 oz). Yet this little creature can steady your camera (up to 275 grams - 9.7 oz). in just about location -- from table top to tree limb. The legs are constructed of 10 flexible joints that enable you to quickly position your camera in just seconds. You even get a nifty quick-release head so you don't have to screw and unscrew every time you want to mount the camera. 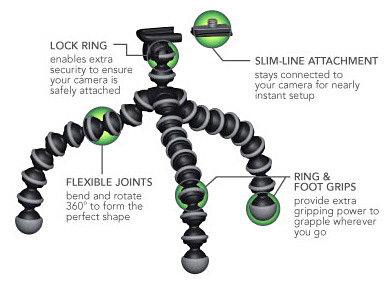 You can purchase the original Gorillapod for $21.95, and the larger sizes for DSLRs for $40 and $50 each. The Joby site has a fun photo gallery of Gorillapods in action. In fact, there's even a flickr gallery called Gorillapod Love dedicated to these little beasties. Good pictures and good fun. 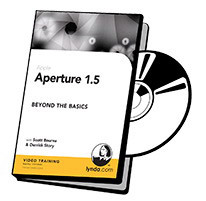 Hot off the press with over 3 hours of tips and tricks, Aperture 1.5 Beyond the Basics is now available from lynda.com. 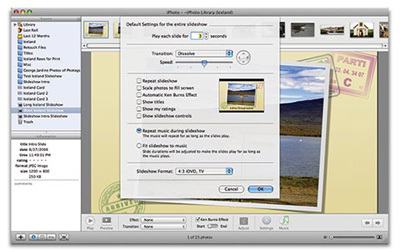 I team up with Scott Bourne to cover Aperture workflow, importing images, using image previews, wrangling with metadata, output, and plenty of new features including edge sharpening, centered loupe, and referenced libraries. Lynda has made a couple of the chapters available for free so you can see if they're your cup of tea. If you find them helpful, you can subscribe to the service for as little as $25 a month (for unlimited access to all titles), or you can purchase the Aperture title on DVD for $99.95. We had a lot of fun recording Beyond the Basics, and I hope it proves helpful for all levels of Aperture users.